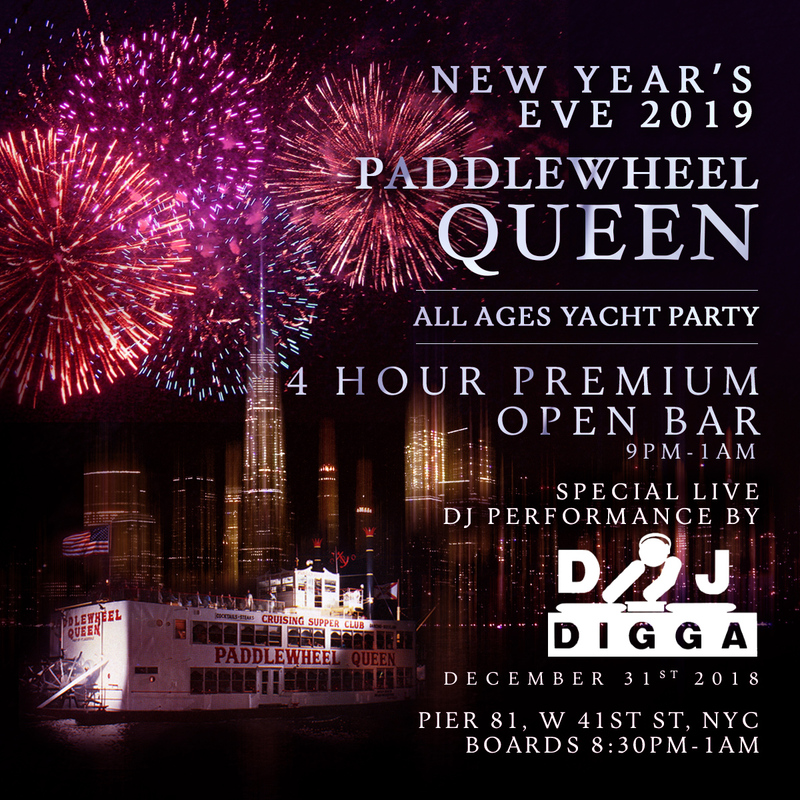 Shake up your family's New Year’s Eve party plans this NYE with the all-ages Paddle Wheel Queen NYC River Cruise, offering a tour of Lower Manhattan all on the most exciting night of the year. This vintage-style ship will turn into a floating party this New Year’s, as guests young and old sample the best amenities and take in all the wonders of New York City. All aboard, New York: this NYE, it’s “anchors away” to the old, and ahoy to the new! New Year’s Eve with the family is best enjoyed on water – no traffic, no crowds, no problem. As the Paddle Wheel Queen first sets sail, guests will enjoy complimentary early evening hors d’oeuvres, setting the mood for an effervescent bash. A four-hour open bar keeps your thirst quenched, while a live DJ ignites the dance floor with the hottest hip hop, Top 40, and house music for all-ages. As midnight creeps in, guests will enjoy a live countdown led by the DJ. As you make your wishes for the New Year, the NYE fireworks will light up the sky above – and you’ll enjoy unrivaled views of this spectacle in all colors of the rainbow. Looking for the royal treatment? Opt for a VIP package that includes reserved seating, perfect for you to sip cocktails and take in the sights of the Hudson. 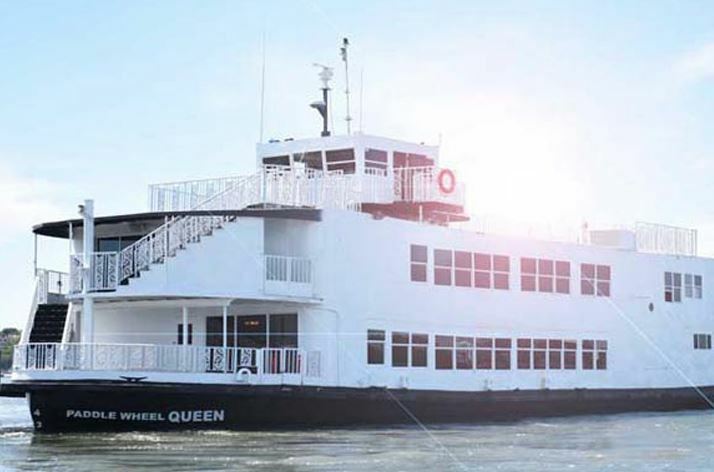 The Paddle Wheel Queen is a classic Hudson River tour, cruising all the best Manhattan sights: Ellis Island, the Statue of Liberty, the Freedom Tower, and the Brooklyn Bridge. The ship harkens back to vintage-style steamships, complete with a Louisiana-style wrought-iron detailing. Featuring a pumping dance floor and well-equipped bar, this cruise offers everything you need for the perfect NYE party. Don’t endure the annoyances of staying on land with the family this NYE – cruise with us to kick-start your year. With the best party people and the whole family as your co-passengers, this New Year’s Eve cruise will glisten like the Manhattan skyline on the Hudson River. **Please be advised that all boat excursions sail at the discretion and command of the NY local Coast Guard. Boarding time is set. However, departures times, length of sailing and return to port times are dictated by the Coast Guard. All event amenities will be provided whether docked or on the water. This event is a nightlife New Year's party. It is not intended to be a dining event. It is recommended that if you wish to have dinner that you do so prior to the event at a place of your choosing. Your admission ticket includes entry to the event, the open bar service (21+) and music performance. Complimentary services are at the discretion of the venue.